Many organizations find it useful to display social media links on their site in order to direct visitors to their accounts on social networks. Social Media links in the Header. Login to the admin section of your GivingPress website. Navigate to Appearance → Customize → Menus. Click the Add a Menu button. 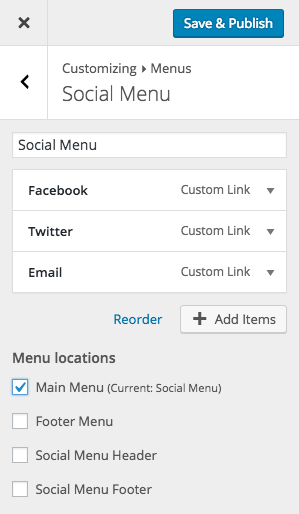 Type the name of the menu (ex: “Social Menu”) in the Menu Name field. Click the blue Create Menu button. Click the Add Items button. Choose the Custom Links drop down. In the URL field, type the URL of your social network account (ex: “http://facebook.com/my-nonprofit/). In the Link Text field, type a name for the link (this will not be displayed on the site). The new custom links will appear on the left of the screen. *Repeat the above steps to create additional menus, such as Twitter and LinkedIn. Note: The theme automatically detects the social network by reading the URL field and assigns the correct icon for the link. Check the box next to Social Menu Header to put your social links in the header of your site. Check the box next to Social Menu Footer to have the links appear in the footer of your site. You should see the links appear in the location you specified in site preview on the right of the screen. Click the blue Save & Publish button. *Note: If you would like two social media link menus (one in the header and one in the footer), you can repeat the above three steps and choose the other menu location.